85 mm specification with glass body. Technical data: pressure setting range: 0.1 - 0.35 bar, max. delivery 350 litres/hour, fuel hose fittings: 5/16"
Filter King fuel pressure regulator has been designed to improve carburettor feeding system. Fuel flow is steady and constant at any weather, ambient and driving conditions, thanks to its wide and sensible diaphragm inside. 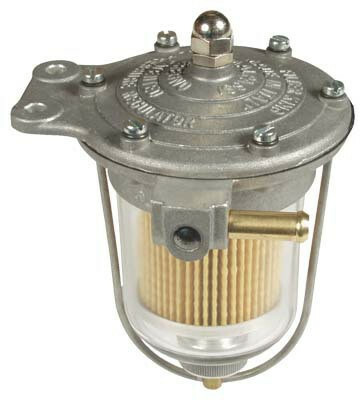 A standard fuel pump can delivery a fuel pressure 5 times higher than the useful to feed carburettor, with overload, stalling or starvation of engine and waste of fuel. Filter King avoids these problems reducing and regulating the fuel pressure, with a perfect idle, immediate and fast start of engine. The vehicle will run smoother without loss of performances at high rpm, as the pressure to carburettor will be set for the max engine power, plus additional safety percentage, according to the size of the needle valve. Filter King is manufactured with the best materials, by accurate machining and quality controls.